Help us save North Texas lives! 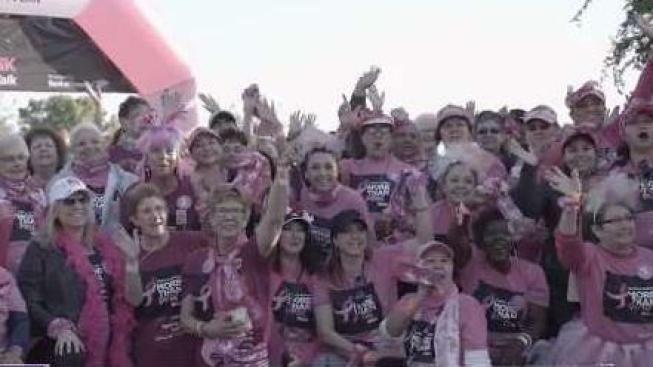 Join NBC 5 and Susan G. Komen Greater Fort Worth at the 2nd Annual More Than Pink Walk on Saturday, April 27, at Clearfork in Fort Worth. Bring your family and friends and walk to raise money to fight breast cancer. There’ll be great music, food and fun for the whole family, so don’t miss this memorable event to provide much needed support for our community. Every week, twenty-four women are diagnosed with breast cancer and four die from breast cancer in the four-county area of Tarrant, Johnson, Parker and Hood counties. For this reason, we are asking you to help us raise money to not only contribute to the national research effort but help us fund local screenings, diagnostics, treatment, support, and education. Komen has been a pioneer in using pink to symbolize and raise awareness about breast cancer. Being “more than pink” highlights the fact that beyond awareness, Komen also funds research, care for those who are living with breast cancer - including metastatic breast cancer - community advocacy and education.